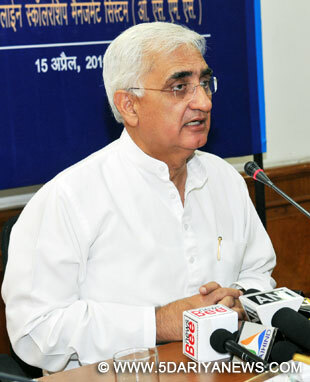 External Affairs Minister Salman Khurshid Friday said India is a land of opportunities, offering a huge, transparent market to the world but stressed the state and the market should work together for the welfare of the people.Saying that economic relations are not the only cutting edge in diplomatic ties, he said: "Its about sharing many things. It is about sharing global future in which we all have a stake. India offers huge opportunities in terms of investment destination; in terms of markets. If people want to improve their own economy by producing a lot, somebody has to buy. "He was speaking at the Ambassadors' Meet organized by the PHD Chamber. Over 100 ambassadors attended the event. "Vast, open and transparent market is available in India. I know some of you would say that it has not opened up fully. But it is the process of evolving and opening. Around 25 years ago India was a closed economy. State played a major, major role in the market. ""But today market is beginning to play a role in the state. Some people may object to it. It does and it must because the state and the market have to work together. It needs to work together for the welfare of the people."